Electroencephalography (EEG) records brain signals from electrodes placed on the scalp. It is the most sensitive neurophysiologic test for brain function. The electrodes are attached with conducting gel and paste to record from multiple and specific brain regions. They send faint electrical currents to an amplifier where the signals are digitized and then displayed as squiggly lines on a monitor. Over its 85-year history, EEG testing has remained a cumbersome and complicated procedure to perform. Equipment is bulky, expensive and confusing to operate. The electrode set-up is time-consuming and requires special expertise. Only qualified experts can accurately interpret the tests. As a result, standard EEG remains an arcane hospital or officebased test with minimal portability. Jordan NeuroScience’s BraiNet® EEG is a revolutionary EEG system that combines anytimeanywhere medical quality brain monitoring with simplicity, mobility, and accuracy to perform EEG at the point of care (POC). Developed with $3 million funding from the Department of Defense, the BraiNet® EEG System provides miniaturization, low cost, modularity, portability, ease of use, accuracy, wireless technology, analytic software, inter-operability, Smartphone mobility and telemedicine connectivity to create a ubiquitously usable EEG by POC medical and non-traditional users. As a uniquely mobile, easy-to-use, and inexpensive EEG device at POC, the BraiNet® EEG is desirable for several reasons. In the Emergency Medical System, Emergency Departments, and sports concussion venues, it promotes earlier and more accurate medical decisions; this is a combined accessible market of 10 million patients/year. In Hospital Intensive Care Units, 20% of patients with reduced consciousness have silent seizures that can produce permanent brain damage and are undetectable without EEG monitoring. For research, the BraiNet® EEG system can be used to learn more about cognitive and psychobiological brain states in “natural” environments outside the laboratory. The BraiNet® EEG has been validated through clinical trials at Duke University Medical Center, is protected by 10 awarded U.S. patents and patents pending, and three Registered Trademarks. Our regulatory status includes four FDA cleared and CE-Marked products, with additional products proceeding through the FDA 510k process. 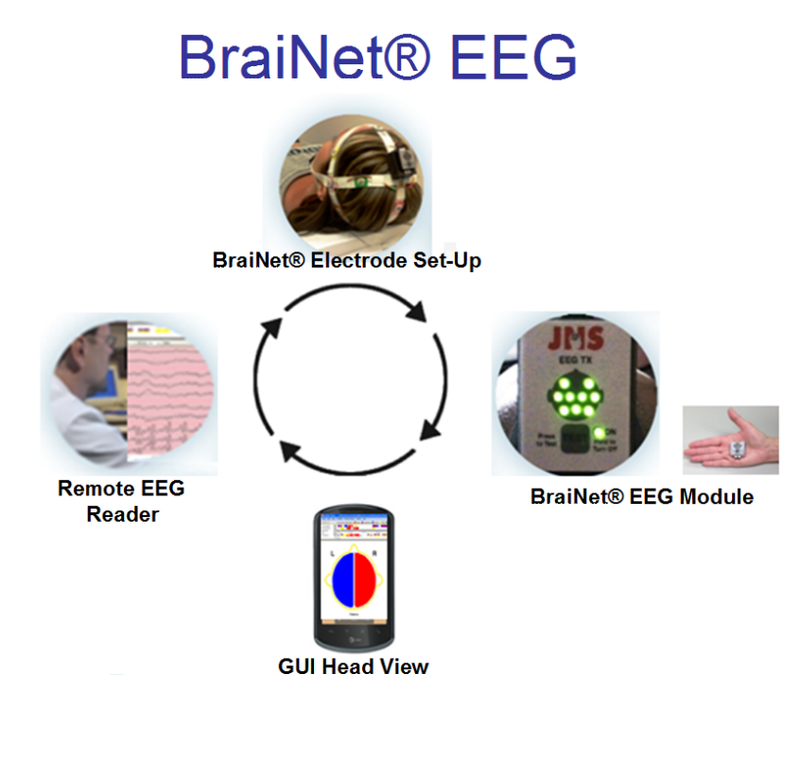 JNS is planning its commercial launch of the “BraiNet® EEG System” in 2014. Our initial target markets are Hospital Emergency Departments and Intensive Care Units. Related Markets of Opportunity include: Home/Ambulatory EEG, Sports Concussions, and Neuromarketing, in addition to the Military and VAH Systems. Working with SBA-backed commercialization accelerators, JNS has generated interest in the equity investment community and is actively seeking capital funding.